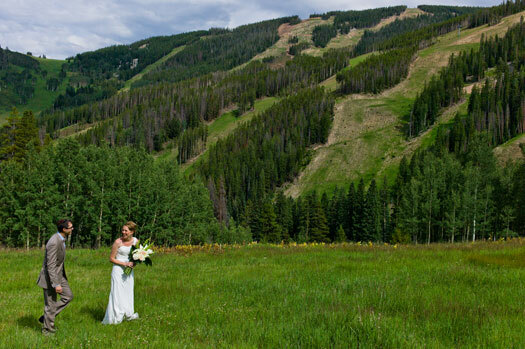 We wanted the wedding to reflect our personalities and our love for Colorado. 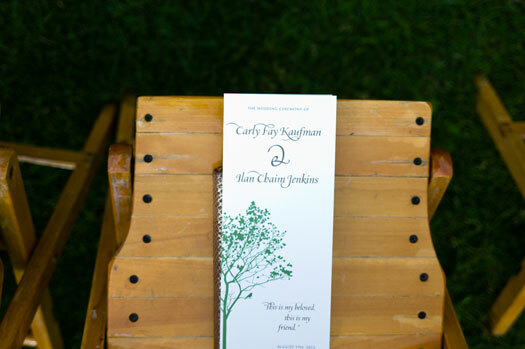 We wanted natural, relaxed, airy, woodsy, understated and uncomplicated. 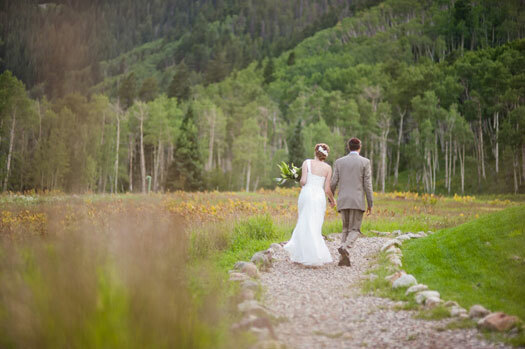 We wanted our guests to escape the Texas heat and experience a gorgeous Colorado summer. 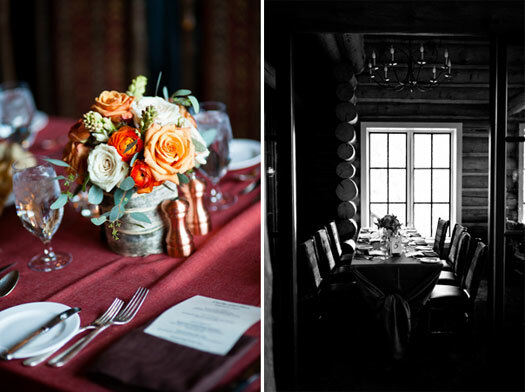 We chose Beano’s Cabin because of its intimate atmosphere and amazing food. 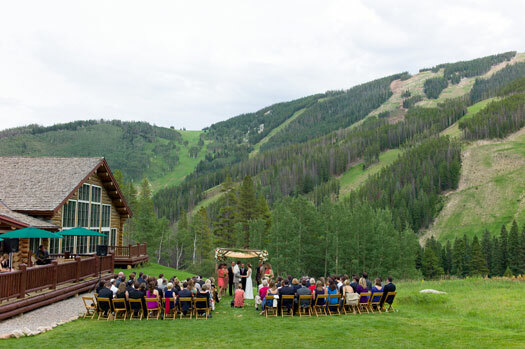 With 94 guests, the reception felt like a large family gathering in someone’s home. 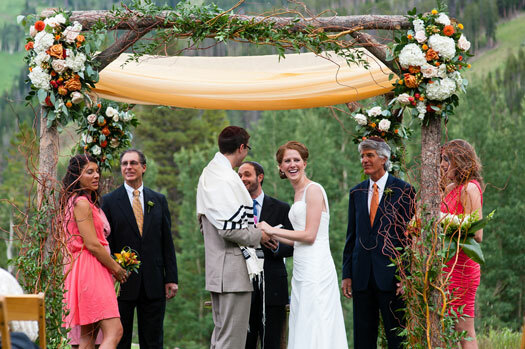 The ceremony was held outside underneath a beautiful Chuppah. 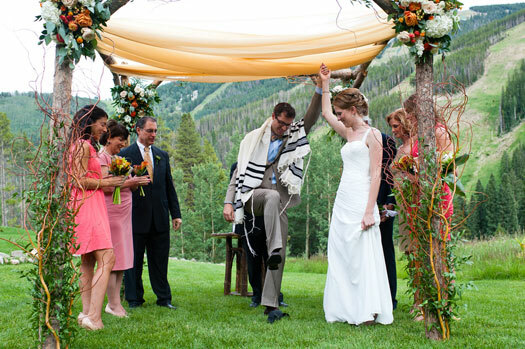 The Chuppah symbolizes the home that the couple will build together and is customary in a Jewish wedding. 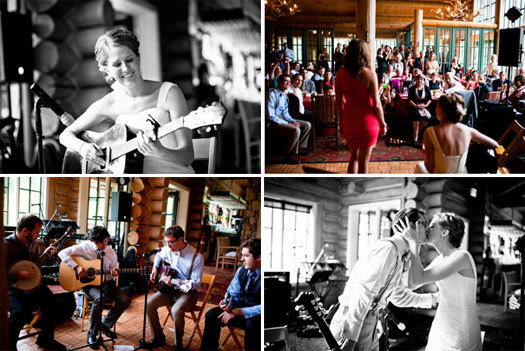 Music is a huge part of our lives so it was important to us that we had meaningful and unique ceremony music. 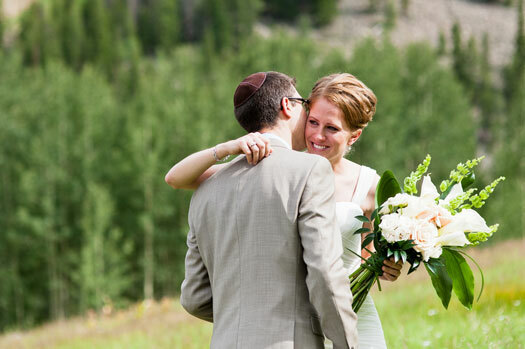 Ilan walked down the aisle to Jeff Buckley’s “Hallelujah”. 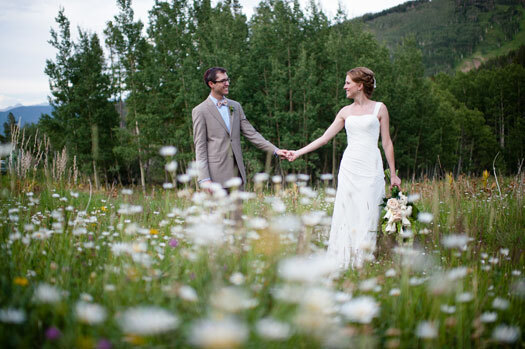 I walked down the aisle to “Falling Slowly” by the Swell Season. This is a special song to us as we saw the Swell Season on one of our first dates. 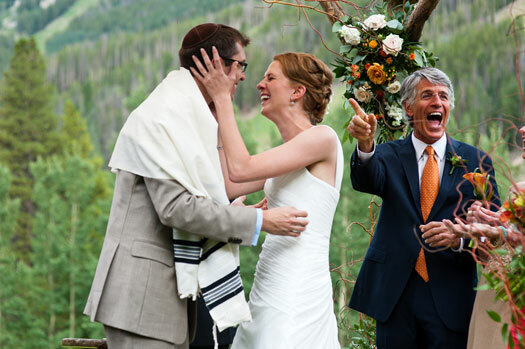 After the Rabbi said “mazel tov”, Ilan stomped on the glass, however, the Rabbi didn’t say “kiss the bride”. I was so nervous I forgot as well and just stood there. Then my dad said “kiss” and I went to give him a kiss goodbye before walking back up the aisle. He really meant for me to kiss my new husband! The pictures taken during this sequence of events are priceless and will forever remind me of a hilarious moment. Our guests signed vintage skis, which now hang on our wall at home. I love getting to look at them every day. 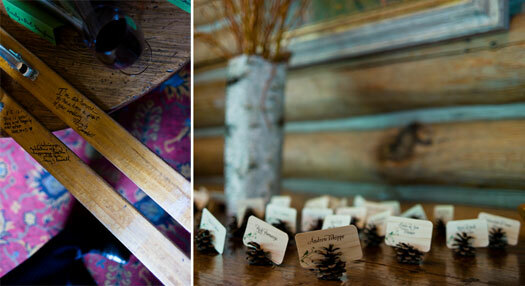 As a surprise for Ilan, I had a custom cake topper created which was carved out of wood. The artist depicted our silhouettes on a tandem bicycle. 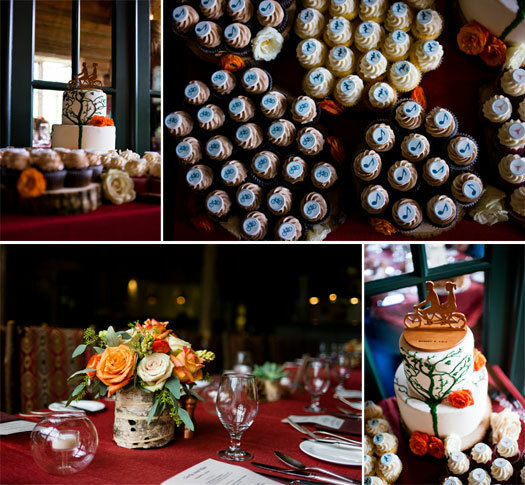 We also had cupcakes, decorated to reflect our hobbies (music, biking, skiing, and Texas Longhorns). Ilan and I each play the guitar. As a planned surprise for each other, we each chose a song and performed it for the other at the reception. My sister sang Jason Mraz “I Won’t Give Up” while I played. Ilan and his band sang and played the “Real Love” by the Beatles. Again, it was very important to us to choose a unique first dance. Since we couldn’t decide, we chose two! We started out slowly to “Maps” by the Yeah, Yeah, Yeahs. Then we surprised our guests by finishing with a Latin style dance to “Tamacun” by Rodrigo y Gabriela. My advice: Choose vendors as soon as possible. Then try not to plan anything until 6 months out. I thought by starting early I’d get to relax at the end but there’s always something to do. Instead, I wish I had set aside dedicated wedding planning days and avoided the daily to do’s and constant emailing with parents and vendors.